A memorial service for Bill will be held at 10:30 a.m., Saturday, April 13, 2019, at the Wallace Family Funeral Home and Crematory in Newton. The family will greet friends from 9:30-10:30 a.m., Saturday, April 13, at the funeral home. Burial will be held at Newton Union Cemetery following the service. William J.J. Brennan passed away on January 23, 2019, at the age of 90. Bill was born on July 3, 1928, to Agnes (Lynch) Brennan and William L. Brennan in Boston, Massachusetts. He graduated from Hyde Park High School. Bill enlisted in the Navy in 1945 and became a Hospital Corpsman. He saw the world with tours taking him to India, Japan, Malaysia, and the Marshall Islands. He was recalled for the Korean War and received an honorable discharge in 1953 as an HM1. Bill married Dona L. Bucklin July 10, 1949. He joined the Maytag Company in Newton, Iowa in 1953 as a part time timekeeper worked his way up to Production Manager for plants 1 and 2. He retired after 39 years of service. He served as a public speaker, frequently speaking on the power of positive thinking, serving as chapter president of the National Management Association, receiving the Silver Knight of Management Award among various other awards. He attended University of Iowa Executive development program, then acted as a mentor to young business professionals. He was a member of the Service corps of Retired Executives Active Corps of Executives, mentoring small business owners. 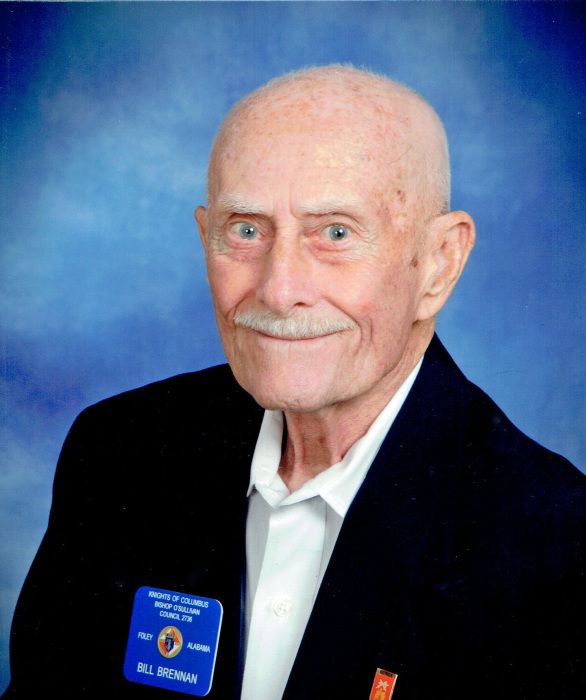 He was a member of the Knights of Columbus, American Legion and VFW. He was a member of St. Joseph’s parish in Lillian, AL. He retired to San Diego where he and Dona resided for 20 years. He worked for the convention and visitors bureau as a supervisor for convention staff and as an ambassador representing San Diego at various conventions around the country. He was preceded in death by his parents; wife, Dona L. Brennan, children: William Steven and Nina Joyce; brother, Paul; sisters, Agnes, Mary and Peggy. Bill is survived by his daughter, Holly Day (Brad); grandchildren Allison James (Justin), Eric Day (Bryan), Adam Day, Nathan Day (Tara); great grandchildren; Grace, Madelyn and Noah James. | 1115 E. 19th St. N.